We all have egos. Kayakers may be a welcoming bunch, always ready to welcome a new member to the club or show a stranger the line on a rapid. We rib each other over our gaffes, celebrate our swims with a bootie beer, and gather together in some of the most unflattering clothing the world can design. But underneath it all we have a little pride. We want to do well and be known for doing it. I am no different. My last post was about the love I felt at the Paddle Golden Gate symposium, but one of the best feel-good moments came a bit later. It came from one of my students, an older gentleman who used to paddle whitewater but found himself in a long boat as he slowed down. He brought great enthusiasm to the class and was happy to talk to another river guy. After the event he searched out my book and sent me a quick email relating to one of the stories inside. Several years ago he found himself in Pasadena, standing next to the Arroyo Seco. He wondered if it might be kayak-able and asked a local friend. He was told it rarely ran, but it had been done in the past. Some locals had done it a few years earlier and apparently had to hike out in the dark, only to find their shuttle vehicle locked inside the parking lot at JPL. But they had kayaked it. That's chapter 12 in A Paddler's Journey. My first introduction to creeking in California and still one of my fondest memories. 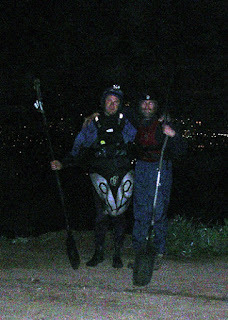 Yes, we hiked out in the dark the first day. And our car was locked in. but we built a ramp out of stones to drive out. My buddies were covered with poison oak and we all had blisters the size of softballs on our feet. We came back the following week to hike in and finish the paddle out. Total success. When I think of the fun moments that paddling has brought me, the incredible views and exotic locations, one of the first images to spring forth is Andreas and Paul standing arm in arm posing atop a ridge overlooking the lights of a city of ten million people. The closeness and camaraderie we found on the Arroyo Seco is something you don’t get from the picnic grounds or a short hike to the falls. It sets us apart from those who never leave their concrete environment; it makes the hardship and struggle more than worth the effort. I overcame my fear and doubt and re-found myself through kayaking, and nothing would take that away again. Thanks, Bix, for making me feel important if only in a little way.